To some extent, I sort of wonder why I keep doing this. So far as I know, I'm the only one who's actually used any of my designs to build a Toast-R-Reflow oven. But still. 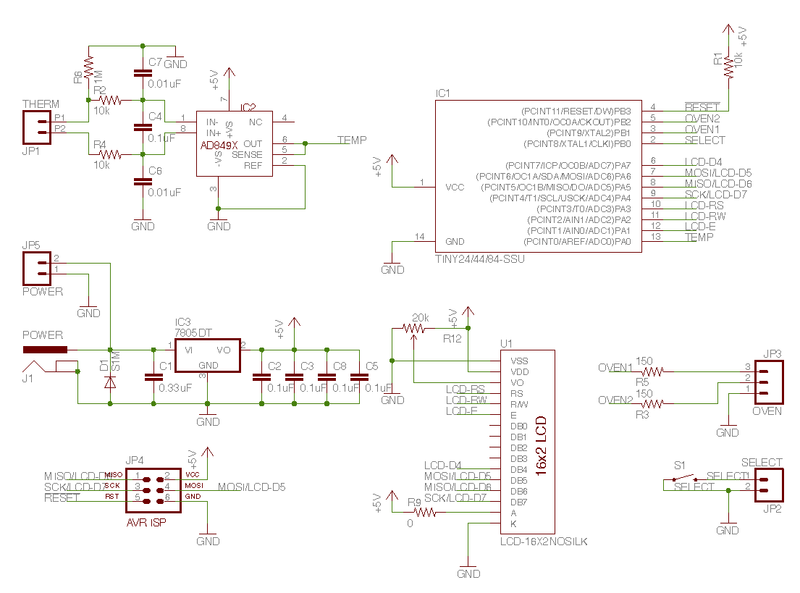 A standalone controller, intended to plug into a separate i2c "backpack" display. This one is based on the ATTiny85 and has an AD8495 thermocouple amplifier. That design is basically a done deal. A display "backpack" controller. The first design still uses an ATTiny85 and the MCP23017 i2c GPIO chip to connect up to the LCD. Although my first prototype had a wiring error, it did prove the concept. A "second generation" backpack controller, which uses an ATMega rather than an ATTiny to give it more flash space. This one is still TBD. 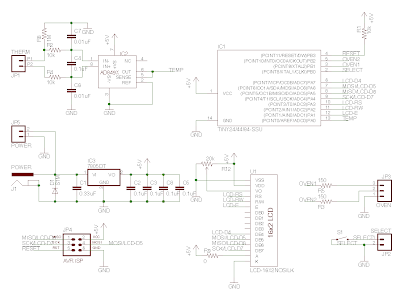 What I've done is come up with a new design for controller number 2: Instead of the ATTiny85 and the MCP23017, I've gone with an ATTiny84. It will use the traditional LiquidCrystal Arduino library intended to talk to a directly connected LCD display. The LCD data bus will be shared with a MAX31855 digital thermocouple amplifier as well as the ISP bus for programming, so that the pins can sort of serve double duty. I've stuck with the same analog thermocouple amplifier for now. It's much cheaper, and seems to work more than well enough. The swap of the Tiny84 for the 85 + MCP23017 saves about a dollar off the design. A display backpack arduino clone?